← Tropical birds wrap dress and Paris fabrics finds! Hi there! I know I’ve been missing in action for half a year. It all started when my helper who was with us for two years returned to her hometown in Indonesia for good. That essentially meant I had to add cooking, doing the laundry, cleaning and ironing to my schedule. There was no time for sewing, and blogging was definitely not on my radar. Two months later, my new helper arrived and the very exhausted me took a short break from doing anything. 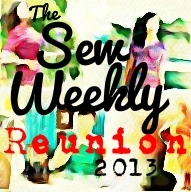 It was tough getting started but two events brought me and my sewing machine together again. My son’s graduation from kindergarten and our South Korea family vacation. I had two months to complete all the projects below, a sweater and a pair of wool bella pants. Unfortunately, I do not have any good photos of the latter two since they were hiding under my coat in cold cold Korea. During a briefing session, the school principal told us to buy an all white outfit of shirt and pants while they would provide a bow and cumber-band for the boys for the event. This was afterall my son’s graduation, a milestone in his life! I told myself, I MUST sew his outfit! And I am glad I did:) The pattern used was Advance 2936, one of the vintage patterns which dear Veronica Darling sent me two years ago (how time flies!). The difficult part was in finding shirt and pants fabric in the same shade of white. Believe me when I say that white comes in countless shades. Eventually I decided to use one fabric for both instead of trying to color match. I found one of suitable weight from fabric.com and it was a poly cotton blend twill. Here’s a photo of my boy (second from right) at his graduation. I also made a 40s Black & Gold Chiffon dress for the event and did not line it intentionally. I love the sheer nature of chiffon and chose to wear a slip underneath instead. The fabric requirement was 3 yards of fabric but thank goodness I managed to cut all the pieces using 2 yards of chiffon I had. The vintage pattern used was McCall 6854. I have always wanted to make winter coats for my family (and off course myself but didn’t have enough time). I needed a fabric that will keep the family warm and yet didn’t cost a bomb since we will not be wearing them in Singapore. After a thorough search, I bought some reasonably price black melton wool which was going at around US$10 per yard from fabric.com so I made hubby and the kids matching black melton wool coats and lined them with a light weight plaid wool fabric. Hubby’s coat was adapted from Simplicity 6887, a pattern from the 70s. The original pattern is for an unlined coat and I had to think through how I could line the coat which came with cuff sleeves and back vent. In the end, I decided to go with normal sleeves instead. The pleats on the pockets were excluded as the melton wool was heavy weight and with pleats, my machine was not going to stitch through the fabric. Besides the light weight wool lining, I used the black melton wool for the inside back yoke and front facings. I totally enjoyed all the top stitching on this one! Hubby’s coat took the longest to complete but it’s so worth the time and effort especially when hubby said it looked “so professional!”:) Here’s my model in his new wool coat. He survived minus 10 degrees Celsius in it. So glad I lined it with wool! Since I sewed the kids’ winter coats from the same pattern (both pdf patterns from Dear My Kids) as the spring versions, I’ll take the opportunity to show you the spring coats I made them for our Paris trip in May last year. I know, I’m SO behind time! Here’s my boy in his spring coat made from Michael Miller’s dinosaur dudes flannel fabric arriving at Charles de Gaulle airport. It is reversible and the other fabric is an orange corduroy. And my lil princess in her black and white polka dotted minky Spring coat running at the park adjacent to the Cite des Sciences et de I’Industrie. It is also reversible as you can see the hot pink corduroy peeking out. One thing I learnt from making the spring coat was that I needed to make the winter version in bigger sizes to make allowance for the layers/sweater within. Here’s the coat’s winter cousins sheltering my darlings from the cold in South Korea. In the fourth photo below, you can see the plaid wool lining used. It’s peeking out from the bottom of my girl’s coat. The armholes and hems were finished with hand-stitching. Now that my son has started primary 1, I find myself busier than ever. However, I hope to sew at least an item a month this year and blog about them. Right now I am working on shirts for my dad and hubby, something I do for them at the beginning of every year. I would love to share with you my fabric shopping experience in Seoul’s Dongdaemun fabric market and the upcoming projects I want to work on for Spring/Summer 2013 in my next post. My struggle is in finding time to have my finished projects photographed so it is likely that you will see photos of me/ others wearing the outfits in our daily lives rather than posed photos. Have a blessed 2013, may it be the best year yet! Welcome back! Gosh I love your use of 40’s patterns – I think we share a similar love in that respect! And your family is all so adorable! I love the things you’ve made for them. Your husband’s coat is smashing – It would be great to make something like that for my man too. Welcome back Adey! So nice to see you and your beautiful family as well as your amazing sewing projects. I know what you mean about being busy and running. A project a month sounds idea.! Happy 2013 to you and yours! Oh my, that should be “ideal”! Welcome back! the coats you sewed for your family looks awesome. Happy New Year and I am looking forward to more of your post . It’s wonderful to get an update! You are fabulous! Such an inspiration! Welcome back! You are so talented and your kids are wonderful. Of course, don’t feel guilty if you’re too busy living to blog about it! All the coats look fantastic, great job and I hope we keep hearing more from you! yay! I am so glad you are back. You’re one of my very favorites sewing bloggers and I love everything you make. Your garments are always classy and feminine, which is very much my asthetic. These coats are beautiful as is your dress. That fabric is stunning. My plan this year is to make a pea coat…my first ever coat and tailored item! So it will be quite a challenge I think. Thanks for continuing to sew and blog as you are an inspiration to me! Welcome back! It looks like it’s been a really busy half a year for you, and you got some great creations out of it! The coat especially. Thank you for your wonderful post. It’s so fun and inspiring to see what you’ve been sewing. I wondered what brand sewing machine you use? I’m needing to replace mine. Glad to see you back! You have some great items there – I’ve been sewing quilts for the last year mostly but now you’ve me thinking it’s time to break out the clothing patterns again! I love all the dresses you made for your family and yourself. How beautiful they are !! I know what you mean about finding time: working all day, and then having to come home and share all the household jobs and homework and getting kids to bed leaves only about one or two hours per day to ourselves, doesn’t it? I’ve finally given in this year and decided to hire someone to come in two or three times a month to do the major cleaning in the house. I should have done it sooner like you, but it’s pretty expensive here in Canada (at least $20/hr), so you really have to think about it! Can’t wait to see more from you. Welcome back! How busy you’ve been! I love your dress, in particular, but all of these makes are amazing! welcome back! looking forward to your creations in 2013! yay you’re back! i just spent 15 minutes looking at all the details of those adorable coats,… when i get kids, i’ll sew for them too. How exciting to have a post from you pop up! You have made some wonderful things in your time away. I especially love your husband’s coat. so gorgeous! Love all your creations! Good job! The husband coat does look awesome! Very cool. Loved all the projects. So glad you’re back . And with avengeance too. It is so important for children to see their parents make things, planning, buying old patterns and so forth. I guess you know this from your days in children’s tv. It is not just a matter of spending money and buying something. It is the fun of the planning/ thinking/ modifying/ oops moments etc and then using/wearing/sharing/showing off/accepting praise for the end product. Please encourage them both to sew at the earliest possible time. It’s nice that you’re back to sewing. Treasure the times with your children because they will pass quickly and before your realize they are all grown up and off to University. People say that all the time, but it’s true. You made some very nice family coats. And I adore your black/gold 40’s dress. Such a lovely pattern. I love everything that you have made for yourself and family. The coats that you made are nice. I especially love your vintage 1940’s dress!! Welcome back 🙂 Such beautiful creations and gorgeous family photos! I was very excited to see you pop up in my google reader. I’m looking forward to reading you again! It’s nice that you’re back to sewing. I`m from germany and like to reeding yout blog! Welcome back! Glad you’re sewing, and thank you for sharing your lovely projects. Three coats? Hats off to you! I adore your hubby’s coat, so stylish, I could almost become a “convert” to sewing for my man 🙂 ! I’m just so happy that you’re back! What beautiful items you’ve made — as usual. I can’t wait to hear more from you. I am so inspired by your dresses and pretty children clothes! I would definitely like to take up sewing as my new hobby. It’s has been my biggest regret not learning all e sewing skills from my late mum who was a great seamstress. Do u have any recommendations for seeing class? Ireally like to start ASAP. I think it is wonderful that your husband appreciates you fine sewing abilities. What a wonderful compliment he always has for you and he is right that coat looks like it came from a professional tailor. You did a fantastic job on the children’s coats too. I really like the fabrics you chose too. Welcome back to you and welcome back to me(to your blog) too. I was away for a long time from your blog as same as reason with you. housework and kids and my personal work and sewing and take care of my blog and and and. I do not have a house helper and i never had so it’s normal to do by myself everything. I know what you mean becuase i saw how different is the life with helper in Singapore. we visited SG to my expert friend family and they had gorgeous Condo with helper. oh, yes. that was good!!!! anyway it’s not reality in Switzerland. How was in South Korea? i’m from South Korea. that’s great to know you went to holiday to Korea. but wasn’t it too cold? i even don’t go to Korea in winter. ok. we have exact same winter in switzerland so that’s not funny for me. Back to sewing, I love your recent Green lace dress so much. and vintage modern denim dress as well. i can see denim in everywhere at the moment. Hope you show us more of your projects. Happy sewing!! !